A visit to the New Brunswick portion of the Bay of Fundy is never complete without a stroll through the fascinating coastal formations of Hopewell Cape. Known as the Hopewell Rocks and also Flowerpot Rocks, these natural geological formations are the result, more recently of tidal erosion. 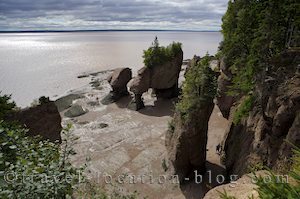 The extreme Fundy tides wash the base of these pinnacles twice daily creating their unusual shapes. A set of steep stairs scale the sheer cliffs and afford visitors access to the ocean floor to explore the caves, and pinnacles however this is only possible at low tide. We recommend you check the tide tables prior to arriving if you specifically wish to visit at low tide. There is a fee of $8.00 per person (adult) to access these public shores and a modern and tastefully decorated visitor centre featuring interpretive panels and information. We were waylaid briefly in the car park at the rocks as we got deep into conversation with a fellow camping couple - sharing our respective travelling stories and camper experiences! Our rig, the truck and camper, draws a lot of attention because of its size even though we try to keep a low profile and is often the basis of conversation with complete strangers. We have met some wonderful and interesting people so far in our travels, who've initially taken an interest in our camper. As far as campers are concerned - size is everything!! Moving right along, we set off towards the Fundy National Park, first taking a deviation towards Cape Enrage Lighthouse (built in 1848) a place for scenic coastal vistas and adventure. In the Fundy National Park we hiked the short trail to Dickson Falls, checked out the covered bridge which spans the Point Wolfe River and enjoyed the scenic vistas of the park and coast before making tracks towards the city of Saint John. We found a campground (Hidden Valley Campground) situated 25 minutes from the city, finally got registered after being initially chased off by an aggressive german shepherd dog named daisy, and settled in for the night. We were still on a mission to get to Grand Manan Island which is why we're not really mucking around too much on this leg of the journey - tomorrow we will check out the city of Saint John.